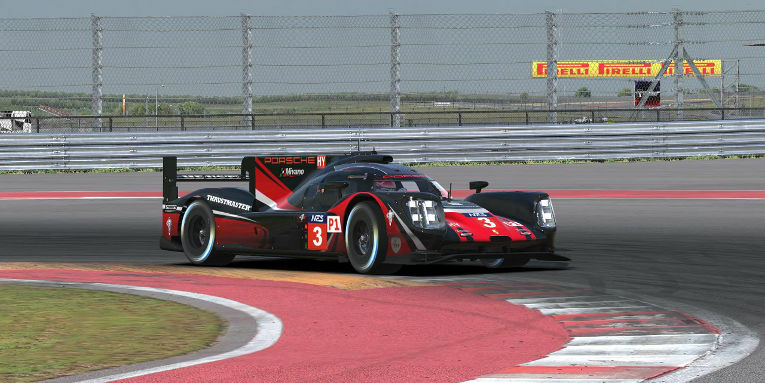 With a proven pace in their season-opening 1-2 finish at Sebring, everyone in the NEO Endurance Series’ P1 class expected Thrustmaster Mivano Racing to contend for the win in round two at Circuit of the Americas as well. However, the wildcards of the series and the circuit, including multiclass traffic and the off-track monitoring system being used for the first time at the technical Texas track, meant that anything could happen in six hours of racing at COTA. It appeared an upset might be brewing in qualifying until Tommaso Carlà recorded a flying lap in the final moments to put Mivano’s Sebring-winning #3 entry on the pole position by just 0.033 seconds over SimRC.de. That dropped Porsche Basel by Sorg Rennsport eSports onto row two alongside Mivano’s #4 Porsche 919 Hybrid. One of those contenders had their hopes dashed just seconds after the start of the race. From the fourth row of the grid, the AVA Vervatic #23 car broke late for turn one, clipping the back of the Race Clutch P1 machine and careening across the inside kerbing to torpedo the Mivano #4 car. They also slid into the path of the #25 Wyvern Racing entry, forcing four of the top seven starters into the pits for repairs. Contact between AVA Vervatic and Thrustmaster Mivano Racing at the start of the race. The lap-one drama wasn’t finished yet, as contact in the esses between Torrent Motorsports and MSI eSports also sent both cars off course. That early action in the mid-field allowed the top three cars to break away, and after the first few trips through traffic, Mivano had opened up a lead of several seconds over the battling SimRC and Sorg pair behind. The P1 field made it through traffic cleanly for the most part, but a few teams did find trouble. One race after their teammates in the #28 car had two early run-ins with GT traffic, the #27 UI1-Positive SimRacing team also picked up a pair of penalties in the first hour for avoidable contact with GT cars in the esses. VRTeRacing and Wyvern Racing also received stop-and-hold penalties for contact early in the race. 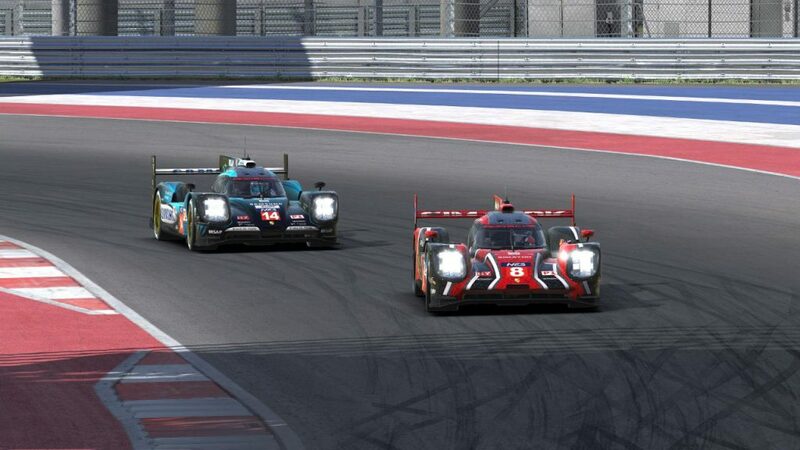 During the first round of pit stops, Virtual Motorsport used the superior fuel economy of its Audi R18 e-tron quattro to briefly take the race lead. It was no fluke seeing them toward the front of the field, though. 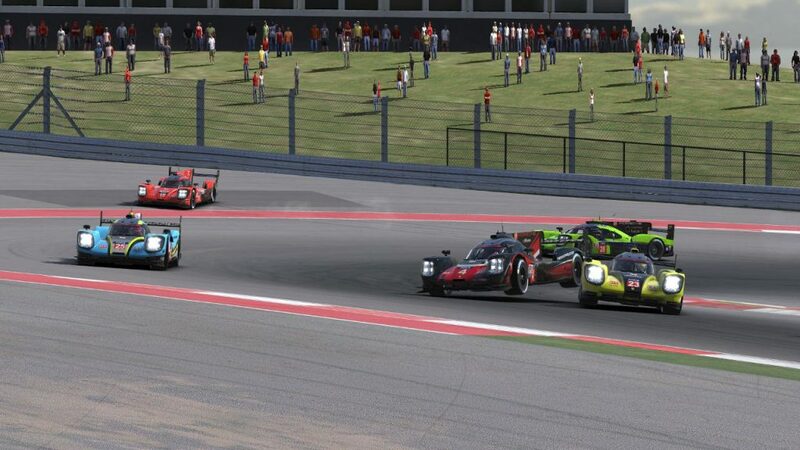 Due to the early incidents and a handling advantage through COTA’s slow corners, Michael Storm and Bas Slob worked their way solidly inside the top five. Virtual Motorsport top the scoring pylon in their Audi R18 e-tron quattro. For much of the race, they were locked in a close battle for fourth place with UI1-Positive SimRacing’s #28 car. Another challenger for that position emerged by mid-race, as Race Clutch recovered from its first-lap contact to climb up the running order. After the midway point of the six-hour event, Mivano’s advantage had grown to more than 30 seconds while SimRC’s Simon Grossman fell into the clutches of Sorg’s Dominik Färber. On lap 120, Färber made the pass entering turn 1. However, the battle wasn’t finished just yet. With an hour and a half remaining, Sorg was spun exiting turn 11 by SimRC’s GT car. The SimRC P1 entry, by then back in the hands of starter Michael Mittner, caught up and made it side-by-side down the backstretch. In the braking zone for turn 12, Mittner couldn’t slow down enough to avoid hitting the #41 RacingCenter Vib3sports P2 car. That contact earned SimRC a penalty and allowed Sorg to take a comfortable hold on second place for the final two stints. Sorg and SimRC fight for position in turn 1. They had no chance of catching Mivano, though, which saw nearly perfect drives by Carlà and Marcus Hamilton to keep their undefeated record in tact so far this season. With a margin of 1 minute, 12 seconds over Sorg when the checkered flag flew, Mivano’s #3 team looked even more impressive in their COTA win as they did one month ago at Sebring. SimRC finished third as the only car one lap down, but the battle behind them remained fierce until the finish. 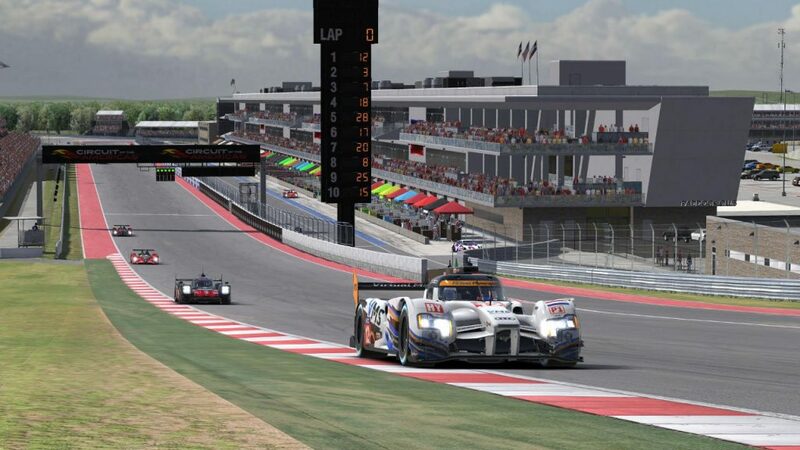 Race Clutch’s Luis Rodriguez held fourth place for much of the final hour, but the fuel mileage advantage for Virtual Motorsport’s Audi allowed them to make a shorter final pit stop and re-take the position. Rodriguez then had his hands full fighting to keep fifth place. With just five laps to go, his #15 Porsche was stuck behind GT traffic through the esses, allowing Wyvern Racing’s Sai Andra to catch up and make the pass. Race Clutch and Wyvern Racing battle each other and traffic. Two laps later, though, Andra exceeded the track limits for the team’s fortieth time in the race, earning a drive-through penalty for falling afoul of the automated off-track monitoring system. That put Race Clutch back to fifth and dropped Wyvern to sixth at the finish. 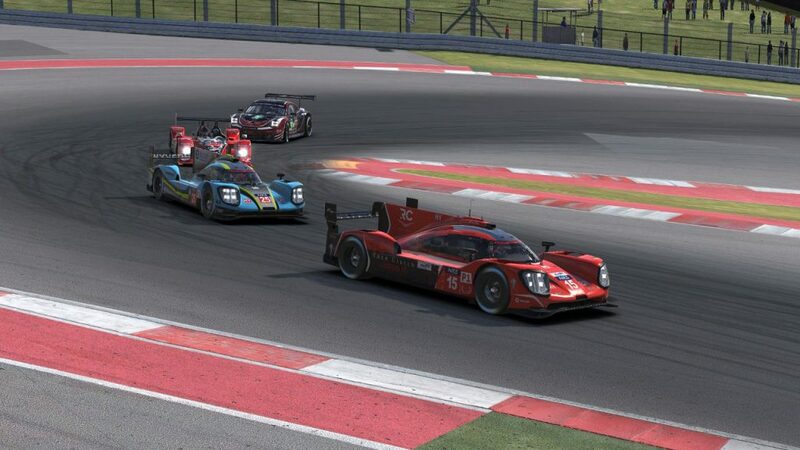 One lap behind them was Team Chimera, which suffered rear-end damage in an early bump-up with SimatoK eSport but salvaged a seventh-place result, and UI1-Positive SimRacing’s #28 team, which couldn’t keep up its early top-five pace and fell to eighth. SimatoK was ninth after suffering a penalty for that contact while Torrent Motorsports rounded out the top ten. F4H Motorsport was the innocent victim of a first-hour incident with the Odox Motorsport GT car, putting them eleventh ahead of VRTeRacing. The Odox Motorsport P1 entry had a top-ten run going but saw it slip away with just two laps to go. While racing SimatoK for ninth, the Odox car stepped out while attempting a pass down the frontstretch, slamming into the outside wall and forcing them to limp home in thirteenth. SimatoK eSport and Odox Racing fight in the final laps. Behind them were more cars that suffered problems throughout the race. The penalty-plagued UI1-Positive SimRacing #27 car and MSI eSports entry, which picked up two drive-throughs for track limit violations, finished seven laps down in fourteenth and fifteenth, respectively. Mivano’s #4 team spent numerous laps in the pits making repairs at the beginning of the race and could only recover to finish in sixteenth. Lap-1 incident instigator AVA Vervatic was the lone team not to finish. 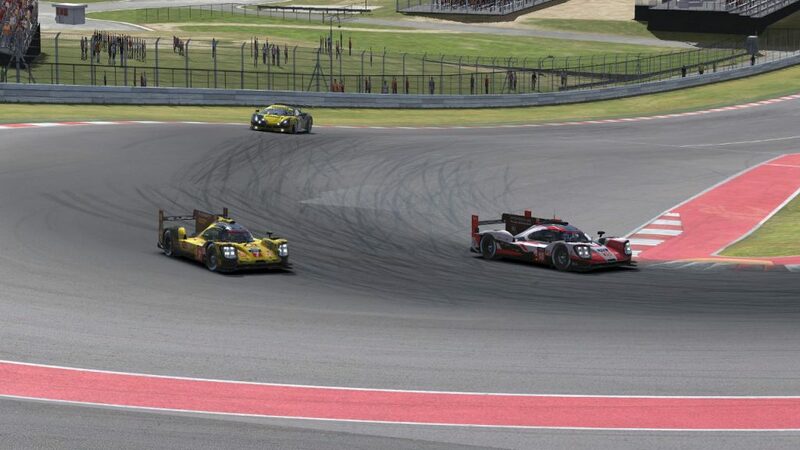 The twists and turns of COTA certainly added some turbulence within the P1 field, but one thing that remains clear is just how strong Mivano’s #3 team is this season. Their traffic management, off-track avoidance — they had the fewest incidents in class at Sebring and the second-fewest at COTA — and sheer pace have given them a growing points lead and made them the clear favorites going forward this season. They say everything is bigger in Texas, and Mivano’s dominance is no exception.